We’d walked up to the Celtic Iron Age burial mounds, just after the sun had set. Owls were hooting in the distance, pheasants squawking and fallow deer stags calling their challenge into the evening air. The sky held the last bright tinges of deep pinks and purples, and dusk had settled firmly in. We went into the darkness beneath the oak and chestnut trees that grew around the burial mounds. There stood a firepit and some logs around it to sit upon. We had gathered some wood the week before, and now lit a fire, honouring its spirit. Saying our prayers to the ancestors, honouring our blood lines, the lines of our traditions and the spirits of place, we spoke softly into the night. We made our offerings and then sat in silence as the fire died, allowing the darkness to enfold us as we meditated upon the ancestors. 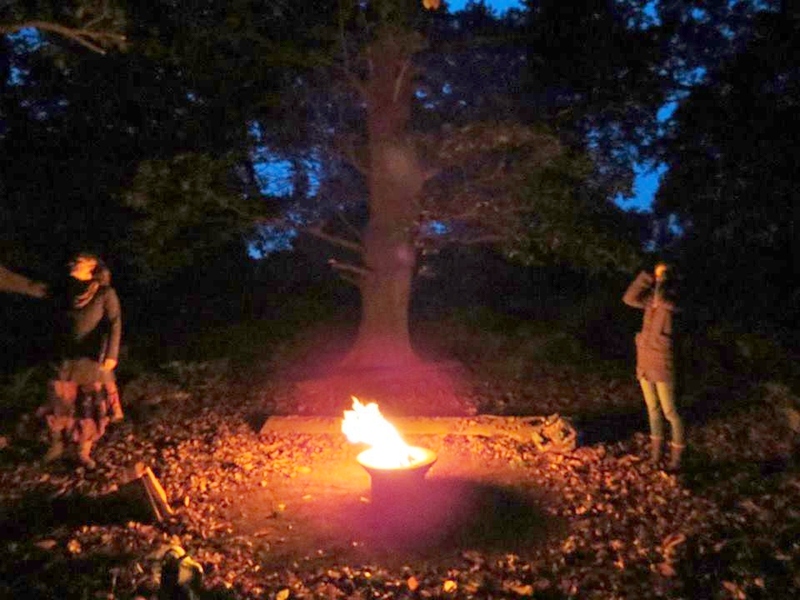 It was a simple, beautiful little Samhain ritual. No scripts, no plans other than bringing offerings, we were wholly and utterly in the moment. Opening my heart and soul to the ancestors, I laid myself bare as I faced outside the firelight towards the burial mounds, saying my prayers and allowing my soul deep integration. Sometimes, however, it is not so good to forget oneself if one has been pushing too hard in their lives. Often, we can forget to take care of ourselves in order for us to function properly. We have to take care of the functional ego in order to let the representational ego fall away… and that means the functional body too. The body lives in the soul. And so, as we walked back down the bridleway, an old track that leads to other, later Saxon burial mounds made famous in the middle of last century by the discovery of a longship and treasure hoard, I felt a pain begin in my chest. I thought it was the mist that was rolling in, being quite susceptible to the damp after experiencing bronchitis a few times in the wet but wonderful land of Wales, where I had lived for a few years. I loved that landscape, but it wasn’t all that healthy for me to live in. The pain in my chest only got worse as the night progressed, and into all the next day. I took it easy, but when on Monday I experienced numbness in my left hand it was time to go to the doctor’s straight away. Series of tests showed that it wasn’t a heart attack, thankfully, and there was no sign of infection either. All the doctors could say was that it was myalgia (muscle pain) in my chest. I’d experienced this twice before, to varying degrees, and been to A&E for the same reasons, done all the tests and, when the pain died down, sent home without any explanation. After doing some research, I discovered Precordial Catch Syndrome, which described my symptoms perfectly all three times it had happened over the last 20 years. Perhaps this is what I have; the doctor’s don’t want to discuss it with me, however, ignoring it when I bring it up. It seems to be taken a bit more seriously in North America, at the very least. At this time of year, I am reminded very strongly of our human strengths and our human weaknesses. Holding the wisdom of the ancestors close to my heart, hearing their songs, seeing the continuation of life in all its manifestations, through birth to death and rebirth, I can work through the physical frailties of this manifestation of my body. The last three years have shown a pattern at this time of year, at Samhain, where the frailties bring me to a new realisation: in 2013, I had chickenpox with a fever that broke through habitual thinking patterns; in 2014 my back went out and I was laid flat out for three days, unable to walk, discovering the limitations of body but not of mind. This year I came very close to my own mortality, with three long days of tests, waiting for results and wondering if there was something seriously wrong with my heart. It brought me even closer to death and my feelings around it. On a very personal level, I had to deal with the fear of death, though with the strength of my beliefs and the ancestors with me, it wasn’t so much fear as sorrow if this ride had to end suddenly, for I am having such a good time in this current manifestation. At any rate, it once again drives home the point that we need to be utterly present, in our bodies and in reality in order to see the magic of existence. It also makes the point that we need to listen to our bodies, to take good care of our bodies, so that we can hear the songs of the universe for as long as is possible in this current manifestation. We can’t take anything for granted. This entry was posted in Druidry and tagged ancestor, burial, celtic, iron age, mound, precordial catch syndrome, ritual, samhai, saxon, sickness. Bookmark the permalink. Oh, wow, almost a parallel process with me and what happened since Samhain – almost the same ritual in the dark woods and the pain on my right side manifesting with which I went to the doctor finally today. Similar feelings of fragility and death, etc. I have been feeling death everywhere in the ‘physical’, very real sense. What a synchronicity. Strangely it made me feel a bit better reading your post, as there are so many parallels, although I am in for a few more tests in the coming weeks regarding my chest, shoulder, etc. Thank you! I love the one sentence paragraph, THe body lives in the soul. I recently had an experience, vision ? wherein I saw souls leaving and than souls coming and it was ancestors coming and going, ancestors to be and ancestors before. souls, old ones and new ones. I’d been through something, too. All summer, spent wondering. I recently had a spot on ovary and my mom had one and hers wasn’t good. She died 18 months later. I spent 12 weeks watching to see if it changed, it did. I spent 8 more weeks waiting for surgery. It was benign. Than I experienced the vision in an inward journey. After, I knew the benign results. Me too, on the ride as I’m really digging this manifestation. For me it was fear, total panic. I didn’t feel ready and I’ve been having too much fun. It’s like I’m just getting there and I’m not ready. I hope you both are well and I just loved this post. This was a powerful testament to the wonder of being . . . being connected to this manifestation and the fear of being torn from it too soon if the journey is a good one. I spent part of Samhain on Glastonbury Tor and the Chalice Well. I felt the ancestors in the Yew trees of the Chalice Well site and the wonder of life and being. I feel the ancestors close, warding and guiding. Am glad that your tests came back clear. You have much yet to share and enjoy.